For the ships, see HMCS Glace Bay. Glace Bay (Scottish Gaelic: Glasbaidh) is a community in the eastern part of the Cape Breton Regional Municipality in Nova Scotia, Canada. It forms part of the general area referred to as Industrial Cape Breton. Formerly an independently incorporated town (1901–1995), the municipal government in Glace Bay was dissolved and the community has been amalgamated into the larger regional municipality. Prior to amalgamation, Glace Bay had been the province's fourth largest urban area and was the largest town in Nova Scotia (in population). Neighbouring communities include: Reserve Mines, Dominion, Tower Road. As early as the 1720s the French inhabited the area to supply Fortress of Louisbourg with coal. They named the location baie de Glace (literally, Ice Bay) because of the sea ice which filled the ocean each winter. In 1748, after the capture of Fortress Louisbourg, the British constructed Fort William at Table Head in order to protect a mine that produced coal to supply the Louisbourg garrison. The fort itself was a blockhouse, brought from Boston, with a palisade. When Cape Breton Island was returned to French control, Fort William continued in service until 1752 when it was destroyed by fire. More permanent settlement of Glace Bay probably can be dated from 1818 when Walter Blackett obtained a grant of land on the south side of the Bay. Coal mining existed on a small scale until the 1860s when four mines were in operation within the future town boundaries. These included the Hub, Harbour, Caledonia and Glace Bay Collieries. The first large mine, the Hub Shaft of Glace Bay opened in 1861 and a total of 12 mines in Glace Bay were in operation. Following the formation of the Dominion Coal Company in 1893, the coal mining industry expanded significantly in what was to become Glace Bay with the opening of several new mines. In 1894, the government gave exclusive mining rights to the Dominion Coal Company. Small communities grew up around the mines and by 1901 they came together to form the Town of Glace Bay. At the time of incorporation, the population was 6,945. By the 1940s, the figure exceeded 28,000 and Glace Bay became Canada's largest town (in population). At one time, the town had 12 collieries but none remain. The industrial decline has seen the core population decrease to 16,984 as of 2001 and has been dissolved/deincorporated since municipal amalgamation in 1995 which formed the Cape Breton Regional Municipality. Glace Bay was once a coal mining town. In 1860 the Glace Bay Mining Company was formed and it operated two mines. The first large colliery, the Hub Shaft, opened in 1861. Large-scale mining commenced in 1893 after exclusive mining rights were granted to the Dominion Coal Company. Glace Bay was incorporated as a town nine years later. At its high point the company operated eleven mines in all, and was responsible for 40% of Canada's coal production. Coal was transported on the Sydney and Louisburg Railway to both of those ports for shipping. The S & L Railway's main operations, including the roundhouse and machine shops were located in Glace Bay. Glace Bay's extensive coal and rail operations made the town the industrial center of Cape Breton. As coal mining became less important, the mines were closed until, in 1984 Colliery No. 26 was closed by the Cape Breton Development Corporation. Many residents of Glace Bay started to work at the two other coal mines in the area: Prince Colliery in Point Aconi and Phalen Colliery and Lingan Colliery in Lingan. However, coal mining continued its decline with Lingan closing in the mid-1990s, followed by Phalen in 1999, and Prince in 2001. Fishing was also an important industry throughout the 20th century. However, by the 1990s fish stocks were so depleted that the fishery was closed. Some fish processing still occurs here. The former town of Glace Bay has a population of slightly fewer than 20,000 people. In 2001, a call centre operated by Stream Global Services, using post-industrialization subsidies opened. The Swiss mining consortium Xstrata was the primary partner in the Donkin Coal Development Alliance, which won the rights to develop an abandoned mine site in the nearby community of Donkin. Currently, the mine is owned by Kameron Collieries, a subsidiary of Cline Group LLC which purchased the operation in 2014-2015. Coal production commenced in February of 2016 and by the fall of 2018, the mine had 120 employees. The Marconi National Historic Site of Canada is located at Table Head in Glace Bay. Parks Canada maintains an interpretive centre at the site honouring the role of Guglielmo Marconi in the development of radio communications. In December 1902, Marconi transmitted the first complete messages to Poldhu from stations at Glace Bay, Nova Scotia. Marconi chose this site for its elevated flat expanse and unobstructed view out over the ocean. Some of the concrete footings for the massive towers can still be seen on the grounds. Marconi built a much larger wireless site west of here then known as Marconi Towers. In 1907 he initiated the first permanent transatlantic wireless service from Marconi Towers to its companion site in Clifden, Ireland. The local landscape is heavily forested and hilly. Some of the low-lying areas at the bottom of hills consist of marshes and bogs. There are rocky cliffs around the ocean along most of the coast and erosion continues to be a problem in some areas; part of North Street fell into the ocean due to erosion and the street was split into Upper and Lower North Street. Many areas surrounding former coal mines are experiencing subsidence as the old mine shafts collapse. There are several brownfields around the community at former industrial sites. Glace Bay has a large amount of forests and swamp surrounding the town and within the town limits. Mammals present in Glace Bay include squirrels, rabbits, fox, deer, mice, muskrats, cats, dogs, and coyotes. Bird species include ducks, great horned owls, Canada geese, crows, seagulls, and pigeons. Pheasant are occasionally seen around wooded areas. Smaller birds such as robins, black capped chickadees, and sparrows are also present. Frogs, salamanders, and snakes are also common in Glace Bay. Glace Bay and the surrounding areas are heavily forested. Common deciduous trees in Glace Bay include poplar, maples, and birches. Oaks, elms and beech trees are also present but they are less common. Common conifers include spruce and balsam with some pine and tamaracks present as well. The introduced Asian plants of Japanese and Giant Knotweed are common throughout the town and surrounding woodlands and are colloquially known as "elephant ears". Glace Bay experiences a cool summer, and windy, wet and stormy winter, version of a humid continental climate (Köppen Dfb) that is significantly moderated by the community's proximity to the Atlantic Ocean. 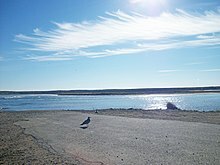 The highest temperature ever recorded in Glace Bay was 36.7 °C (98 °F) on 18 August 1935. The lowest temperature ever recorded was −31.7 °C (−25 °F) on 31 January 1873, 29 January 1877 and 15 February 1916. Because of its close proximity to the Atlantic Ocean, Glace Bay, like all of Cape Breton Island, experiences strong seasonal lag. The ocean does not reach its maximum temperature until mid August. It usually stays there until early September. This makes August the hottest month in Glace Bay rather than July which is usually the hottest in most northern continental climates. February is also the coldest month on average rather than January. Federally, Glace Bay is located in the riding of Cape Breton–Canso, currently held by Liberal MP Rodger Cuzner, who has represented the riding since 2000. Provincially, the riding of Glace Bay, which is formed by the former town boundary is currently held by Liberal MLA Geoff MacLellan who won a by-election on June 22, 2010. The riding had been held for ten years by Liberal MLA Dave Wilson until his resignation in March 2010. Dave Amadio, NHL hockey player, played for the Los Angeles Kings. Vivian Berkeley, award-winning blind lawn bowler. Linda Bond, former General of The Salvation Army. John Bernard Croak, war hero, WW1, recipient of the Victoria Cross. Doug Doull, NHL hockey player, played for Boston Bruins and Washington Capitals. Clarie Gillis, Member of Parliament, Cape Breton South, 1940–1957. Gordon Sidney Harrington, former mayor and former premier of Nova Scotia. Andy Hogan, Member of Parliament, Cape Breton—East Richmond, 1974–1980. Drake Jensen, country music singer. Pat MacAdam, Author, advisor of Prime Minister Brian Mulroney. Henry Poole MacKeen, Lieutenant Governor of Nova Scotia, 1963 to 1968. MacLean & MacLean, comedic team. John W. Morgan, former Mayor of CBRM. Daniel Petrie, Hollywood film director. Logan Shaw, NHL hockey player for Florida Panthers, 76th overall pick. Doug Sulliman, NHL hockey player, 1979 New York Rangers 13th overall draft pick. ^ Based on station coordinates provided by Environment Canada, climate data was collected near downtown Sydney from January 1870 to March 1941, and from April 1941 to the present day at Sydney Airport. ^ "A Brief History of Glace Bay". cbv.ns.ca. Town of Glacier Bay. Retrieved July 3, 2017. ^ a b "Mining in the Region: Introduction". The History of Mining in Cape Brenton. Cape Brenton Miners' Museum. Archived from the original on February 8, 2005. Retrieved July 3, 2017. ^ Montgomery-Dupe, Sharon (3 January 2019). "UPDATED: Donkin mine operations suspended after roof collapse". The Chronicle Herald. Donkin, NS. Retrieved 4 January 2019. ^ Marconi National Historic Site of Canada. Canadian Register of Historic Places. Retrieved March 24, 2013. ^ "Guglielmo Marconi - Biographical". Nobelprize.org. Nobel Media AB. 2014. Retrieved July 3, 2017. ^ a b "August 1935". Canadian Climate Data. Environment Canada. September 22, 2015. Retrieved March 2, 2016. ^ a b "January 1873". Canadian Climate Data. Environment Canada. September 22, 2015. Retrieved March 2, 2016. ^ "January 1877". Canadian Climate Data. Environment Canada. September 26, 2016. Retrieved March 2, 2016. ^ a b "February 1916". Canadian Climate Data. Environment Canada. September 22, 2015. Retrieved March 2, 2016. ^ a b "Sydney". Canadian Climate Data. Environment Canada. 2011-10-31. Retrieved April 8, 2016. ^ "Sydney A". Canadian Climate Data. Environment Canada. 2011-10-31. Retrieved April 8, 2016. ^ "Sydney A Normals". Canadian Climate Normals 1981–2010. Environment Canada. 2013-09-25. Retrieved April 7, 2016. ^ "March 2012". Canadian Climate Data. Environment Canada. 2011-10-31. Retrieved April 7, 2016.